The promise of the accountable care organization business model is attractive and fairly simple: Coordination among healthcare providers will deliver better health outcomes and reduce costs. Proper coordination and patient monitoring should prevent duplication and errors, make chronic disease management more efficient, reduce hospital stays and readmissions and boost patient satisfaction — thus delivering healthcare services more cost effectively. The reality is, as usual, more complicated than the promise. Some studies suggest that although monitoring and screening all patients might prevent a small number of expensive interventions, such a one-size-fits-all approach can increase overall costs. To avoid this, ACOs need data mining and analytics to predict which patients will require the most costly interventions and then target the more advanced care management tools, monitoring and post discharge follow up to those patients, thus balancing high-quality care with budgetary stewardship. Meaningful patient engagement is a critical component in that data-rich process. It helps ACOs intelligently measure and evaluate return on investment within the context of regulatory and program participation requirements and objectives as well as generally accepted business standards. It should be noted that the healthcare industry has yet to achieve consensus about how to assess the ROI of ACOs, much less of integrated provider organizations in general, or even of health IT. A 2012 Healthcare Intelligence Network survey on the ROI of ACOs, for example, revealed that when ACO administrators were asked whether they were seeing a positive return on their investment, 52 percent responded it was "too early to tell," 36 percent indicated they "don't know," nine percent reported ROI of 2.1–3.1 percent, and three percent reported ROI of 3.1–4.1 percent. ACOs have continued to proliferate despite the early lack of clarity about ROI, mainly because the benefits inherent in (or at least promised by) the model are highly appealing to a variety of healthcare stakeholders. In February 2013, Leavitt Partners estimated there were a total of 428 ACO programs across 49 states and 32 such arrangements created within 22 different health plans. The growth of the ACO model among both the private and public sector suggests the long-term viability of this healthcare delivery model. ACOs appear to be creating a vehicle for restoring the focus on primary care and the important role physicians can and must play working as the "quarterbacks" of the healthcare system. 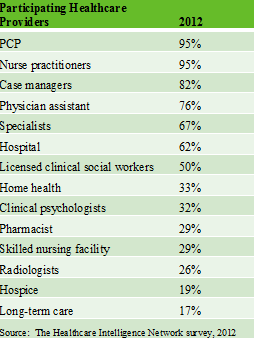 Physicians are now leading the majority of ACOs. ACOs, and other efforts to enhace care coordination, have resulted in higher pay for primary care physicians. Payors are putting a premium on care coordination, to the benefit of PCPs. Median pay for PCPs is increasing at a faster rate than for specialists, and CMS proposed payment increases for family physicians of approximately 7 percent and for other practitioners providing primary care services of between 3 percent and 5 percent. Providers also seek to offer optimal care to patients, respond to the increase in chronic conditions (which account for 84 percent of all U.S. healthcare spending), and value opportunities to conduct or participate in medical research. 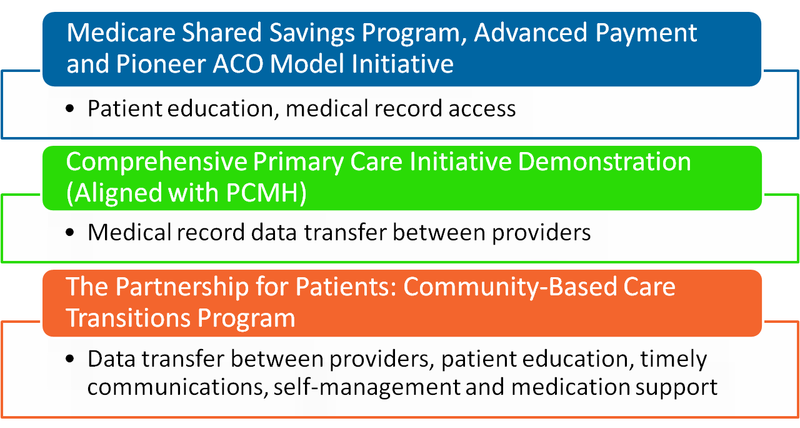 These emerging integrated provider networks, like ACOs, offer a myriad of those and other benefits to clinicians of all types. 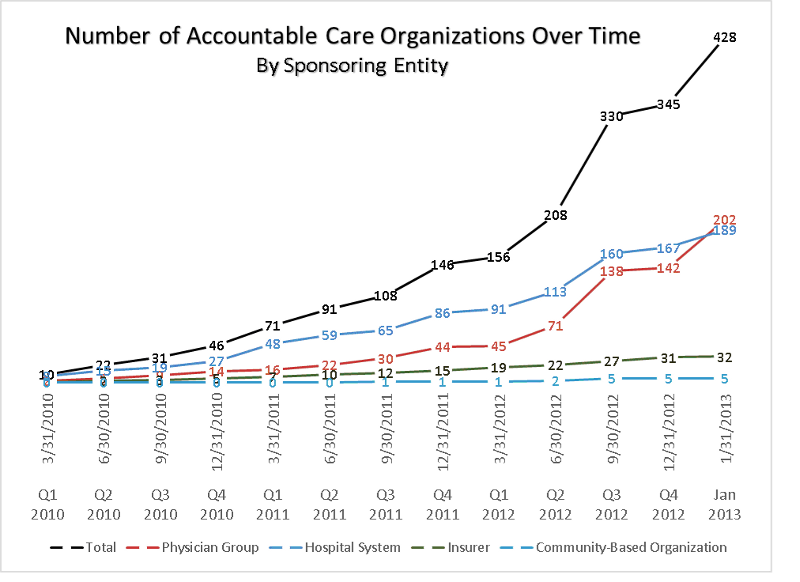 Non-provider sponsors, like pharmacy chains, see ACOs as a way to access shared-savings grants and reimbursements. For example, Walgreens announced a partnership with New Jersey-based Advocare to form an ACO to serve more than 500,000 patients; the company is also participating in CMS ACOs in Texas and Florida. The likelihood that government regulations and grants will continue to drive the uptake of technology-based patient engagement solutions, regardless of their ROI, also supports the long-term viability of these organizations. To succeed, ACOs must embrace patient engagement, which has repeatedly been shown to improve clinical outcomes, increase patient satisfaction and improve efficiencies in service delivery. Managing patients with chronic disease, facilitating care transitions, reducing hospital readmissions and achieving ROI all depend on the deployment of sophisticated patient engagement and care management solutions. It's good business. Patient engagement solutions can positively impact ratings, social media, online reviews and customer satisfaction. It supports the attainment of financial incentives to improve outcomes and explore new delivery and revenue models. It helps manage system-wide pressure (via penalties and reimbursement reductions) to reduce costs. And most importantly: it improves outcomes. 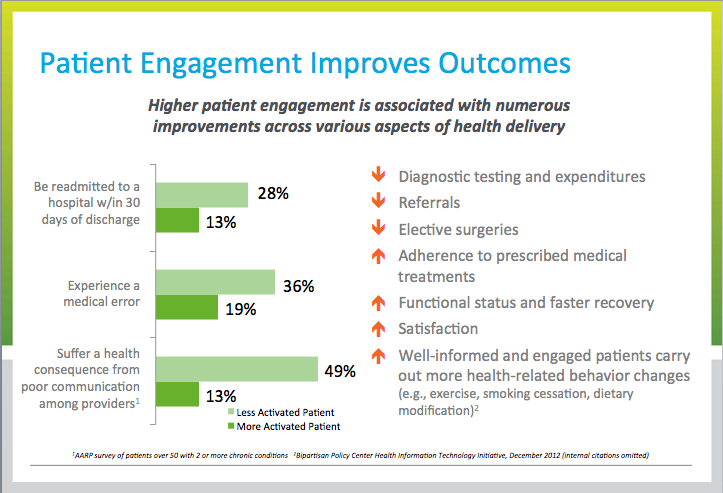 Higher patient engagement is associated with numerous improvements across various aspects of health delivery, showing reductions in diagnostic testing and expenditures, referrals and elective surgeries, while delivering improvements in adherence to prescribed medical treatments, functional status and faster recovery and satisfaction. Moreover, well-informed and engaged patients carry out more health-related behavior changes. Thanks to advances in health IT and the work of many solutions providers, ACOs have turnkey resources available to support patient engagement. With meaningful patient engagement at the center of each of the key changes occurring throughout the healthcare industry, ACOs that embrace it will more effectively bridge the gap between the promise and the reality of their business model. Cortney Nicolato, CPHIT, is vice president, healthcare strategies at Get Real Health. Founded in 2001 in Rockville, Md., Get Real Health is an award-winning global health information technology pioneer specializing in patient engagement and connected care solutions.